Today’s project is going to be a real treat for you. Well, actually, it’s a treat box. In the upcoming Occasions Catalog, one of the cool new products is the Silver Mini Gable boxes. The boxes come in a pack of 12 and they are food safe. These are going to be perfect for when you want to give away some homemade treats. But you know you can’t just give away a plain box. You definitely need to make an adorable tag for it. 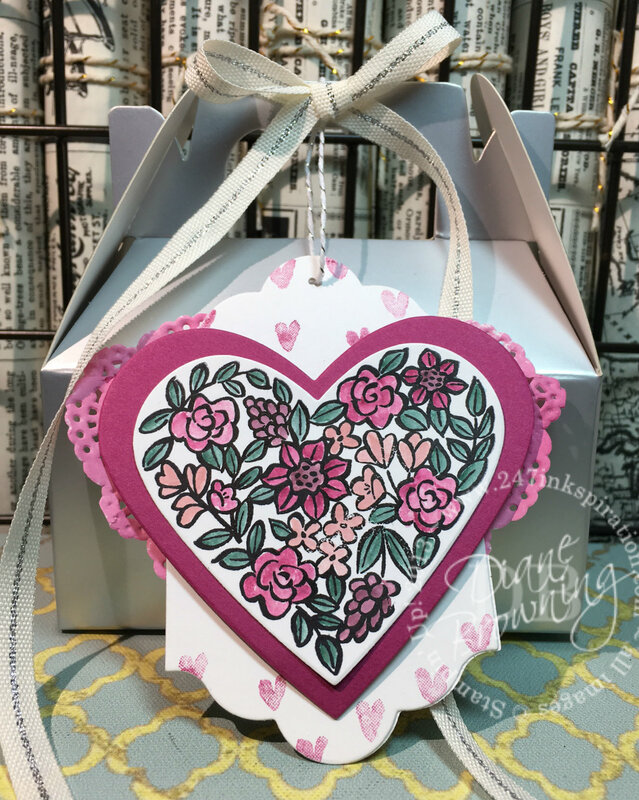 This tag is made from the Heart Happiness stamp set, which has hearts of all different shapes and styles. This gorgeous floral heart was by far my favorite in the group. To make this tag, you’ll start by stamping the floral heart in Archival Black ink. Then you’ll water color it using Berry Burst, Powder Pink, and Fresh Fig for the flowers and Tranquil Tide for the leaves. I colored over the top of some of the flowers with Clear Wink of Stella. 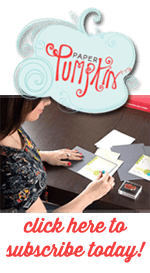 Once your ink has dried, die cut the heart and then die cut a slightly larger one in Berry Burst. The white tag is one of the Lots of Labels framelits. I picked a size that worked with the size of the heart. For the mini hearts on the white tag, I used the mini hearts from this stamp set and stamped off once before I stamped the tag. And I kept repeating this until the white tag was covered. The doilie was spritzed using a combination of Berry Burst reinker with rubbing alcohol in one of our spritzers. The doilie is glued to the back of the white tag. To finish it off, I stamped a second white tag and glued it to the back of the doilie for a finished look on the back side. Remember, hearts are not just for Valentine’s Day. You can give your heart to someone any day of the year. To Hop to the next page, click the Next link here and it will take you to Katharina Baranski’s page. Or you can check out any of the pages by clicking on the name below. Gorgeous!!!!! Love how it dangles and live those hearts in the background. You’re right Linda! I didn’t notice that until you mentioned it, but it does look like an angel. Thank you!